Over time, I have fallen madly in love with Caron! Whilst in paris a few months ago, visiting a Caron boutique was at the top of my shopping list. I adore everything from the parfums to the heavenly cygnet down puffs ♥ To me, Caron evokes everything a parfum house should be. 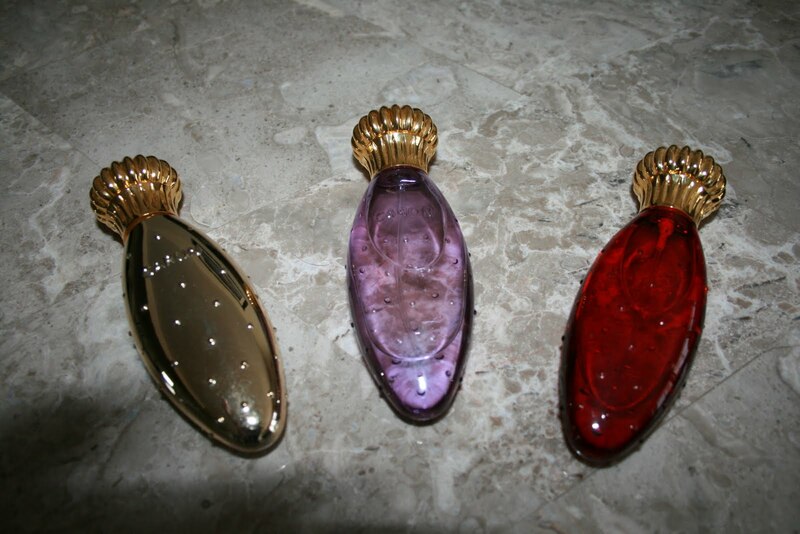 Parfums Caron was founded in Paris by Ernest Daltroff in 1904. 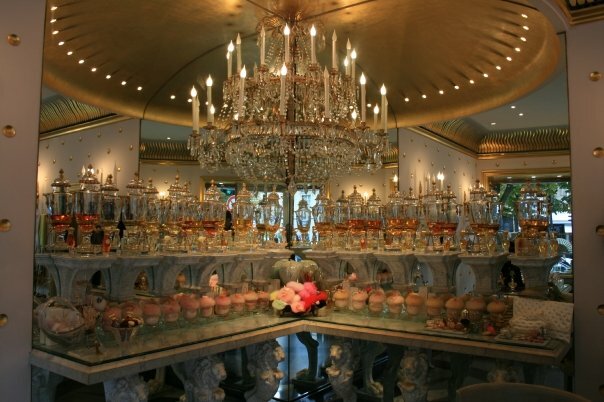 It is one of the last perfume houses to still have an in-house master perfumer. There are only three boutiques worldwide ~ two in Paris and one in New York. In the salon, you may choose any of thirteen extraits encased in the legendary Baccarat crystal fountains finished with olde world gold braids. While Caron offers 34 fragrances for men and women, the thirteen frangrances housed in the fountains are exclusive only to the three boutiques. The fountains are every bit as lovely as I imagined them to be! Below the fountains are the delicate cygnet down puffs. These heavenly puffs are not only soft as a cloud, they caress your skin to leave a uniform complexion ~ luxurious and practical. What else can a girl ask for? They come in an array of colours and three sizes. I own the large, and a smaller size for my Caron compact that I carry in my handbag. I hope to add the entire rainbow to my collection. 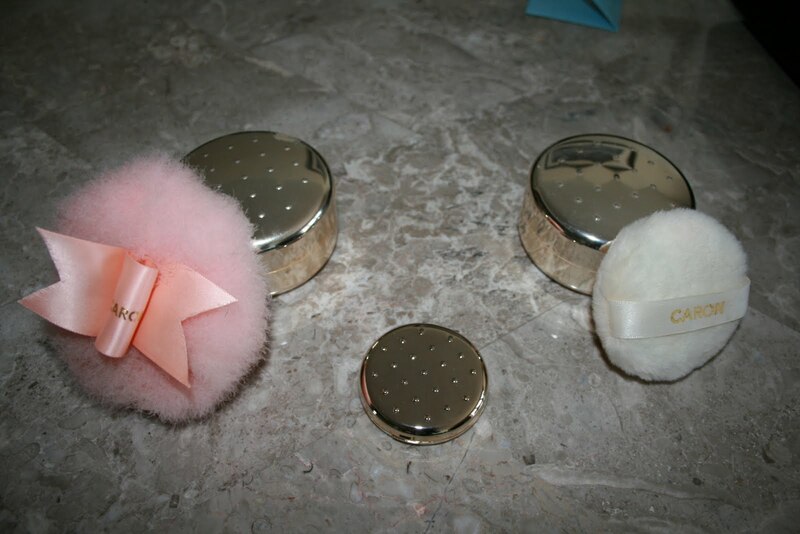 The puffs pair wonderfully with the loose powder. Not only are the containers chic, they look pretty sitting on your dressing table ♥ The silky powder smells delicately of Bulgarian Rose and is made of raw minerals from Italy, camelia oil, vitamins A and E, and UV filters. They are perfection! The powders are offered in 19 shades ~ ranging from matte to shimmer and full coverage to sheer. 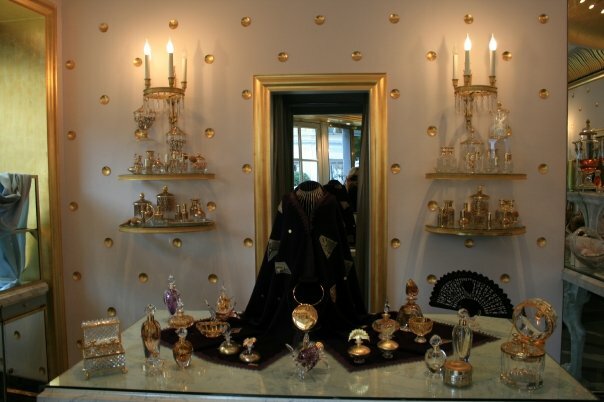 While I love the gold container, I’m admiring one of the glass goblets for my dressing table next. This day, I chose Or et Noir to be encased in the purple lay down bottle. The lay down bottles are my favourite. I own three ~ red for Rose, purple for Or et Noir and gold for Nuit de Noel. I absolutely love rose scents! Caron also offers porcelain and crystal limoges, jewlery, purses, shawls and men’s ties as well as an array of exquisite bottles. I could have spent hours in this boutique! Caron, you will always remain at the top of my list in Paris, and New York! Lovely history and pics, darling! I too have been to their store in paris. My favourite perfume is their Infini. If you love rose perfumes you must check out Malle's Une Rose. It is the best rose scetnt around IMO . Lovely post, Caron is such a beautiful store and all their products are so feminine and romantic. Or as your daughter would say lots of ooh la la! I'll be following along and will be back soon. Lady Jicky, I don't recall Infini. I will ask for a sample when I order from the NY boutique soon. N`Aimez Que Moi is next for me. Thank you for the recommendation for Une Rose ~ it is now on my wishlist to sample along with Creed Fleur de Thé Rose Bulgare. Bonjour Romance, I agree ~ Ooh La La! Oh that is so delightful, I love it! I went to this store and it was raining and cold and early so I had it all to myself! The saleslady was amazing and I tried almost everything. I took home Infini and a pink puff, but what the hell…why not a powder??? I mean, how did I not know about this? I have not tried the one you bought, what is it like? The only other one I have is French Can Can which I love. I love your lay down bottles! Having the boutique to yourself is wonderful! I, too, had the boutique to myself , very nice. 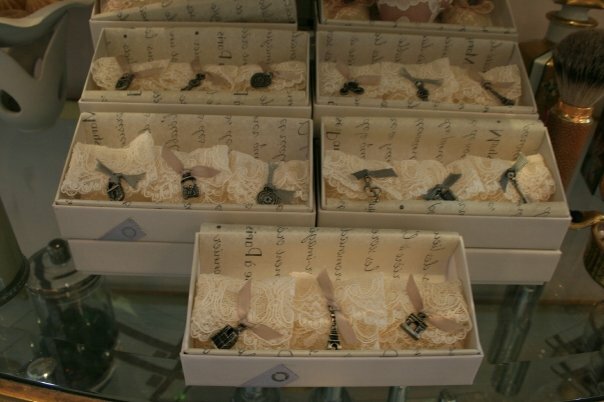 You can have samples sent from the boutique in NY. If you get the chance, you must try the powder. Or et Noir is a deep rose scent. I receive many compliments when I wear it. Very lovely.